Nowadays there are about ten varieties of anubias which are popular among aquarists. All these plants come from tropical Africa areas. Most of the species can be rather seldom encountered in amateurs tanks, since they are challenging in terms of keeping and care as well as because they grow slowly, especially in tanks. Anubias barteri var. nana is one of the most slow-growing tank plants and one of the most widespread among all anubias species. It has become popular due to its small size. Most of anubias species are quite large. For example, Anubias barteri var. barteri grows up to 20 inches (50 cm high). Anubias nana size as a rule doesn’t exceed 7 cm, more often it is about 3-4 cm high. Except Anubias nana there is one more small sized Anubias species. This is Anubias barteri var. nana petite. It is even smaller than anubias nana. The size of its leave doesn’t exceed 1 inch (2.5 см). Nowadays this is a very rare anubias variety and it will be for a long time, since it grows even slower than anubias nana. Anubias nana is encountered in the tropics of West Africa, in forest bogs, shores of small rivers and streams, in or out of water with its roots in it and leaves growing above. During floods the plant gets completely covered with water. The plant has trailing roots and tigellum with a rosette of petiolate leaves. Its lamina is solid with feather like venation, the midrib is on the down side of the leaf. This species forms thick imbricated carpet of oval dark green glossy leaves. The largest bushes are about 4 inches (10 cm) high. You should place anubias nana in the foreground of a tank. During the whole year the plant grows equally both in aquatic and air medium. Anubias nana blooms from time to time. If it happens quite deep in the water, the flowers usually don’t reach the water surface. The flower itself is quite plain and for those who have no idea how it is supposed to look the blooming may go unnoticed. The flower can live for several weeks. When it becomes unattractive it’s better to cut it off without waiting for natural end of its life cycle. Anubias nana and anubias nana petite are quite undemanding tank plants. Additional CO2 and fertilizers supply isn’t necessary for them. However, you shouldn’t forget about optimal pH level for tank plants, it should be in the range from 6 to 7. Weekly water renew (30% of the tank volume) can supply anubias nana with all required nutrients. The plant has low growth rate which means that it doesn’t need large amounts of nutrients. The plant can be kept only in tropical tanks. Preferable tank water temperature is about 24-28 °С. If the temperature decreases up to 20 °С, it will cause the plant stasis. Water hardness and violent reaction have no sufficient effect on growth rate of anubias nana. It is approximately the same both in hard water with weakly alkaline reaction and in highly soft water with acidic reaction (hardness 2-16°, рН 6-8). The tank water must be clean. Mud particles that appear in the water settle on the plant leaves and affect the nutrition process. Though anubias nana can stand some fouling appearance better than other anubias species, yet it grows quite poorly in old and especially muddy water. Therefore, weekly water renew is a must. As for the light amount that should get to anubias nana, the plant prefers moderate lighting. In a common tank with bright lighting it’s better to put the plant in the shadow of some small-leaved tank plants. The light can be both natural and artificial one. You should cover the plant from direct sunlight. The lighting intensity in the tank mainly depends on the needs of other tank plants, since anubias nana can be considered the most shade-resistant tank plant. Therefore light day for it should last at least 12 hours. Anubias nana substrate should be rich in organic substances. It’s not necessary to supply newly planted anubias nana with additional fertilizers, since silt that will form in 1-2 months is quite enough for the plant nutrition. It is better to use large grained river sand as the substrate. Anubias nana root system is comparatively small and it doesn’t penetrate deep into it. In a substrate that consists of large particles the plant roots don’t develop that good, therefore sand and small pebbles are more preferable in this case. When planting anubias nana only its roots should be buried into the substrate, not the rootstock. Growing anubias nana rises above the substrate and forms a tight matting of the roots which supports the whole plant above the substrate. Quite a lot of tank fishes find their shelter in this matting of the roots later. Anubias nana rootstock is quite branchy. New shoots that you see on it can be cut off and planted somewhere else in a tank once they form about 5-6 leaves. This is how this plant is cultivated in aquarium. Getting anubias nana seeds is almost impossible for amateurs. Like all other anubias species this plant can be grown in a paludarium and in a greenhouse with high humidity level. As a terrestrial plant it prefers temperature 26-30 °С and ground that consists of humus, peat and sand. 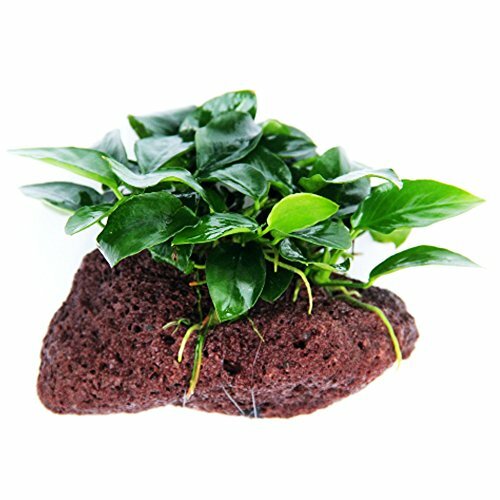 We should mention that unlike other anubias kinds this one demonstrates the same growth rate both in a tank and in a greenhouse. However, in the latter it doesn’t get covered with algae and looks more appealing. Anubias nana growing in a tank almost doesn’t require any mineral feeding. If it grows in a greenhouse, you can feed it twice a month with complex fertilizers dissolved in irrigation water according to the recommendation on how to use these fertilizers properly.